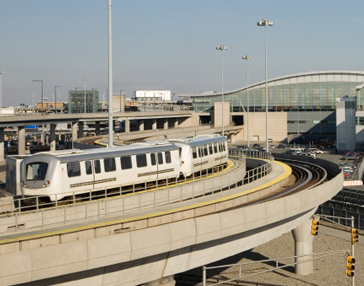 AirTrain JFK Electronic Signage Study | Resource Systems Group, Inc. The Port Authority of New York and New Jersey (PANYNJ) needed to gather feedback about new customer information monitors that were installed in the transit stations for AirTrain, the JFK Airport transit system. RSG designed and conducted focus groups to obtain feedback on the new customer information monitors. Five groups of participants took part in the focus groups: AirTrain customer service agents, customer service supervisors, operations center operators, operations center supervisors, and airline customer service representatives. RSG used the focus groups to gain insights into improvements that could be made to the information screens to help customers better understand how to use the AirTrain system. Based on these groups’ feedback, significant changes were made to the monitors to improve communications with AirTrain riders. These monitors are in use 24/7 at all AirTrain JFK stations to make using the system easier for riders (take a look the next time you’re at JFK! ).